Here’s another great restaurant tip for you! If you are looking for a great place to grab a bite to eat and watch the game, Drafts Sports Bar and Grill is the place for you! Step into a restaurant filled with sports decor..even the servers are dressed as referees! On top of the decor, their menu features a variety of delicious options! Their menu features favorites such as burgers, flatbreads and appetizer selections complemented by an extensive selection of draft and bottled beers, specialty microbrews, mature wines and a wide array of cocktails. This modern sports bar also features high-definition flat screen televisions broadcasting local, national and worldwide sporting events. There’s a TV just about anywhere you happen to look. They also have giant screens to ensure that everyone will get to see the game! Draft's Sports Bar & Grill features breakfast options such as eggs, bacon, turkey sausage, biscuits and gravy, French toast and seasonal fruit. Lunch and dinner selections exceed expectations with a wide variety of menu options to choose from. The signature, palm-stretching burgers are sure to impress even the biggest burger fanatic. After eating lunch or dinner, make sure to save room to enjoy a slice of their famous Triple Layer Turtle Chocolate Cake. 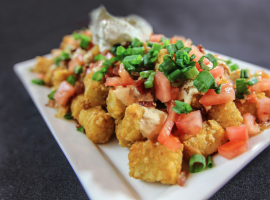 You will definitely not leave hungry after stopping by Drafts for an awesome meal!